Question: Connecting clusters of cells in 2 adjacent time points. Hi, I am doing single cell RNA-seq I have 9 time points and roughly 200 cells in each time point; There is no a control-treatment assay rather I am working with a developmental process. Cells from a growing unicellular mold (Time point 0) are being starved and single cell sequencing on cells harvested each 2 hours onward has been done. Now, I have a matrix; columns are my cells and rows are genes (Until here I described the basics). I have clustered cells in each time point by Seurat R package that gave me roughly 2-3 clusters of cells for each time point. I have done differential expression between cells in each time point to obtain marker genes specific to each cluster of cells. Now, I have to find the similarity between clusters between time points; I mean, for instance, if I have clusters a, b and c for hour point 2 and cluster a', b' and c' for hour point 4, what is the relationship between these clusters (similarity, parent_child)? I have tried some algorithm like URD that try to connect cells by arranging them in a pseudotime manner afterward making a tree of related cells (lineage). However they don't take into account the fine clustering within each time point (only care about start and end time points). tries to connect cluster of cells in 2 adjacent time points to each other in a parent-child way (later and earlier time points). Here as a control to see if I am running that properly, I put 3 clusters of cells from one time point and tried to connect clusters to each other; For example if I have clusters a, b and c, I expect a be more similar to a, b to b and c to c (as I am comparing one time point to itself); But what I am obtaining is not revealing as this picture. but did not help me to get the point. I looked at the methods in the Farrel supplementary, and it looks like that would be possible. I have not worked much with scRNA-seq, but I developed my own method for single-cell CyTOF data. 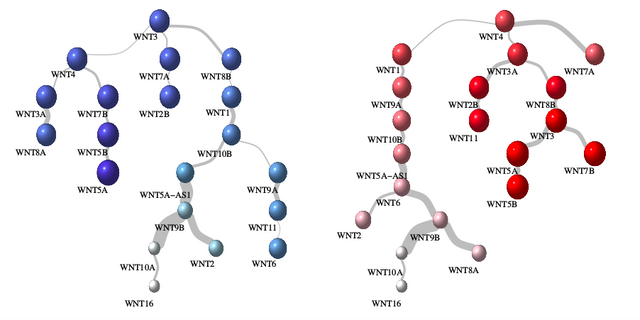 There, it is possible to plot cellular 'lineages' and then compare them. Actually, statistical methods for the 'comparing' part are still being developed. Although I have some ideas about how to do this, I have not yet implemented them, but I believe others have. Thank you Kevin, I have to go through that thoroughly; Likely here you are connecting genes to each other but in my case I must connect cluster of cells to each other where each cluster of cells has its own expression matrix and marker genes. 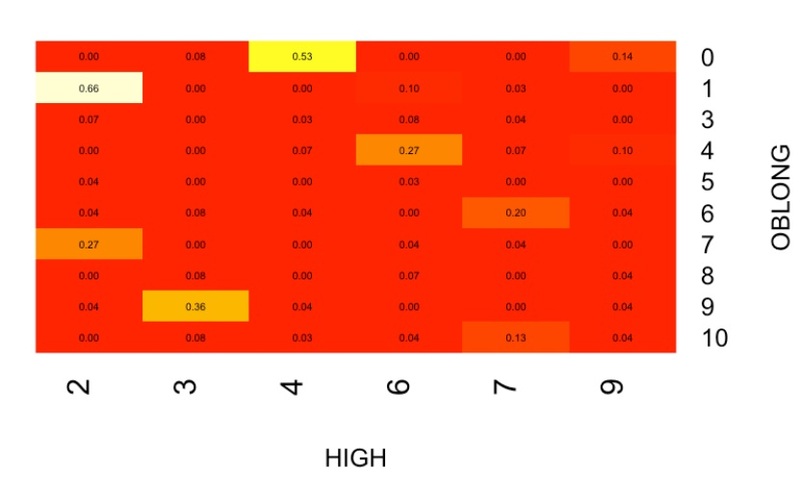 Based on my second heat map if HIGH is the first time point with 6 clusters and OBLONG is the second time point with 11 clusters; If I want to connect each cluster in HIGH to clusters in OBLONG, I must use common genes between each pair of clusters? Alternatively, do you have some summary function for each cluster that produces the same type of output for each? Actually I only have name of cells in cluster, expression values of genes for each cluster and markers genes specific to each cluster. how to convert genetic distance matrix to dataframe and rank genotypes based on distance? How to get log2 fold change of RNA-Seq data for time series experiment?